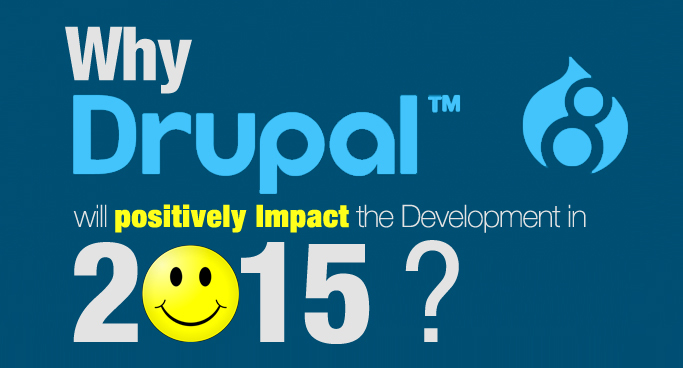 Why Drupal 8 will Positively Impact the Development in 2015? Drupal 7, the open source CMS, simplified the web content management with its release. It became more user-friendly, flexible and powerful, with a more intuitive interface and better module management capabilities. And above all these it also got recognized as an ECMS (Enterprise Content Management System). Drupal 8 is under development with beta versions being released; the release date of stable version has not been announced yet. Drupal 8 is expected to provide over 200 new features and improvements. Special Focus has been put on in making Drupal Core’s accessibility better, which makes it possible to fix accessibility issues at the source, passing on the improvements by default to themes and modules being used. Let us read how Drupal 8 will positively affect the development in 2015 with its enhanced capabilities!! Drupal 8 will be the most accessible version having a centralized control for internet applications. The biggest enhancement is the additional semantics in the form of HTML5 and WAI-ARIA that will be beneficial to the users that use assistive technology. It will now be possible to centrally leverage ARIA Live to enable screen reader when updating dynamic content, without reloading a page. TabManager will restrict tabbing to inessential elements to provide users, a functional workflow. CKEditor has also been added to simplify HTML editing. These features will improve the accessibility, giving users an enticing experience. Views is one of the most powerful and popular add-on module of Drupal 7, has been brought into the core CMS with Drupal 8. This change has made customizations easy and has ensured an enhanced accessibility for Drupal administrators and the end users. Views UI has been made more semantic along with adding accessibility improvements for table views. Drupal 8 has been made mobile-first with all the built-in themes being responsive including the administration pages. This will ensure an enhanced user experience on various device screens. All the Drupal apps as well as add-ons will be responsive by default. Drupal 8 has also come out with screen compatibility feature to get a preview of how content looks on various screen sizes. HTML 5 has been included in Drupal 8 to make sites fully optimized with smartphone and tablet screens. HTML 5 will also ensure that Drupal sites are feature-rich and leaner with all the power-packed features including built-in audio and video playback. Drupal 8 is backed by the powerful and flexible Symfony framework, which is a PHP-based framework that helps build robust applications. This will make the development process easier and faster for developers with no requirement of wasting time on repetitive code, reduced overhead due to better caching and a whole lot of useful features. This integration with Symforny2 will help Drupal developers to create dynamic and powerful applications. Drupal 8 now includes the flexible and fast template engine for PHP called as ‘Twig’. Twig separates login and display in a better way and ensures improved security. It also enables writing templates in an easy-to-learn syntax, making learning simpler for developers new to Drupal. Twig makes designing attractive and functional Drupal sites user-friendly. Drupal 8 brings enhanced language capabilities and flexibility, specially for businesses with global presence. It has made the creation of multilingual sites easier with improved language maintenance options and translations including some easier customization settings. This is going to help both end-users and developers. Through built-in UI, users will be able to select their primary language and also be able to change the default language at any point. Drupal 8 has new editor functionality and uses the WYSIWYG editor (What You See is What You Get), making it easier to format and edit content. Drupal 8 allows in-place editing of content without any requirement of using the full edit form. There is drag & drop buttons, allowing easy personalization of content and images with caption. These are just a few highlights of Drupal 8 before its stable release. Drupal 8 has incorporated amazing new and flexible features to adapt to the modern web development. These updated features will give power and scalability to Drupal sites, giving an enticing user experience. Drupal 8 does have powerful features, user-friendly & simpler UI and an improved core technology, making it one of the most sought-out CMS in 2015. Semaphore Software is a leading Drupal web development company offering complete Drupal web development services and solutions including Drupal website development, Drupal customization, module development and providing Drupal CMS solutions to list a few. You can contact us through info@semaphore-software.com to get the benefit of our high-quality, scalable and robust Drupal development services! !